Is it possible to combine abdominoplasty with other procedures? A classic abdominioplasty is also known as a radical abdominioplasty. An abdominoplasty (or tummy tuck) is the removal of any excess skin and fat from the lower abdomen as well as repairing the muscle separation of the anterior abdominal wall. These may be causing problems with the skin - including infection and dermatitis. This may be associated with people who have lost a large amount of weight or women who have had previous pregnancies. Any separation of the rectus abdominis muscles can be retightened and corrected. This will result in improved abdominal tone which may be resistant to usual toning techniques. This would also improve the weakness as well as enhancing the appearance of the muscles of the abdominal wall. Repairing the separation of the rectus abdominis muscles will also lead to an increase in core strength. Many patients also feel that back pain may be improved. Furthermore, some stress and urge incontinence of urine may be reduced by having this muscle repair performed. Abdominoplasty also helps to create a more “normal” appearance to the abdomen by removing the excess apron of skin and fat. Any abdominal hernia or bulges that are present will also be repaired at the time of surgery. The operation may involve removal of the skin and adipose (fat) tissue that is excessive. Classically the skin and fat are removed. The umbilicus is islanded and left in place and then the skin is mobilised around it to create a new hole for relocation of the umbilicus. A new umbilical position may be relocated into an aesthetically ideal position. All patients have the procedure performed as an inpatient and remain in hospital for two to five days. Most patients are discharged home without drains which are removed during their inpatient stay. Repair any abdominal herniae that may be present. The operation may involve approaching only the skin if this is the only element that is excessive. It may progress to performing excision of skin, fat as well as mobilisation of the umbilicus. Usually an incision is made in the lower half of the abdomen and abdominal skin is removed between this incision all the way up to the umbilicus. The skin above this is then undermined allowing it to be pulled down to meet lower incision. A new umbilical position will be relocated in an aesthetically sensitive manner. Before the skin is closed the underlying muscles are surgically tightened with stitches. Drains are then placed and the skin is stitched together using dissolvable stitches. A mini abdominoplasty is indicated in patients who have a moderate degree of excess skin in the lower abdomen. It is also suited to women who have separation of their rectus abdominis muscles below the umbilicus. The procedure involves making an incision which is smaller than that of a standard radical abdominoplasty in the area above the pubic bone. The skin is undermined up to the umbilicus and the separation of the muscles below the umbilicus is corrected. The excess skin is then removed. This procedure is also helpful in correcting the bulge which can be present above a lower horizontal scar, such is the case after a caesarean section. Dr Belt will be able to advise you at the time of your consultation if you are a suitable candidate for a mini abdominoplasty or, if the degree of skin you have is beyond the scope of this operation and/or your muscles require repair up to the ribcage (xiphisternum), then this technique may not be powerful enough in which case a radical abdominoplasty would be a more effective procedure. It is generally recommended that patients obtain their goal weight prior to surgery and the surgery is general performed after patients have lost weight and their weight is stable. However, there are situations were patients may still have some areas of excess adipose tissue that have not responded to weight loss. These areas can be dealt with either a staged procedure having liposuction prior to an abdominoplasty, or alternatively, can have the two surgeries performed at the same time. The central upper abdomen is where the blood supply to the flap raised for an abdominoplasty obtains its blood supply. For this reason it is generally not safe to perform liposuction to the upper part of the abdomen. Other areas on the abdomen and torso are safe areas to perform liposuction simultaneously with an abdominoplasty. The area that responds best is generally the outer part of the upper abdomen (flanks) extending onto the lower back. 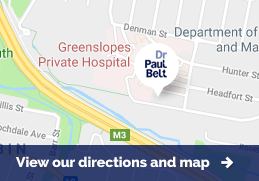 Dr. Belt will be happy to advise if you are a suitable case to have the combined procedure. Liposuction to the centre of the abdomen is not performed at the time abdominoplasty as this increases the risk of wound related problems. It is possible however to perform liposuction to the flanks “love handle’ area as this area is not directly involved with the surgery and does not increase the operative risks. This surgery is usually performed as an inpatient and patients can be expected to stay at least one night in hospital. Drains will be inserted into the wounds which exit below the wound through the midline of the abdomen just above the mons area. These may stay in for a number of days after surgery if the drainage is excessive. Most patients have the drains removed 3-5 days after the surgery. You will be expected to wear a support garment around the abdomen for a period of six weeks. You will be seen daily whilst an inpatient then at regular intervals usually for a period of 12 months. It is possible to perform an abdominoplasty with multiple other procedures. These may include breast surgery (augmentation, reduction and lift/mastopexy). The advantage of combining these procedures is that it leads to a complete transformation of the appearance of the anterior part of the torso. There may also be significant cost advantage to the patients by combining procedures. Please refer to the section on combined abdominoplasty and breast augmentation, combined abdominoplasty and breast lift, and combined abdominoplasty and breast reduction.